This free online calculator will calculate what a past, present, or future sum of money was or will be worth at another point in time. The calculator's historical inflation calculations are based on the actual United States Consumer Price Index, which ranges from 1913 to 2018 (updated annually). Future inflation calculations are based on a combination of the CPI history and your own estimated future inflation rate. The calculator also calculates the average inflation rate for any past period, which will help to make more informed future rate predictions. 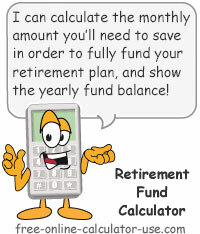 Finally, the CPI Calculator also creates a printable, year-by-year report for each of your calculations. Why is the inflation rate important? What causes the CPI to rise or fall? 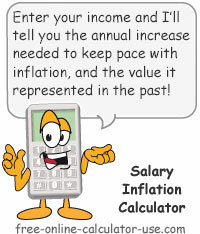 Calculate the effects of inflation or deflation on a past, present, or future sum of money. Enter a dollar amount to begin calculating the effects of inflation or deflation on (without the dollar sign or any commas). This amount should coincide with the year you enter on the next line. Enter the year that corresponds to the amount entered in the line above. Note that the start year can be a past, present, or future year, but cannot be earlier than 1913. Enter the year you would like the calculations to stop at. Note that the CPI Calculator will only allow years from 1913 on up, and all calculations beyond 2017 will be forecasted based on your entry on the next line. Enter the average annual rate of inflation you expect will occur for future years (without the percent sign). This figure will only be used if the time period involves any years beyond 2017. This amount is the ending relative buying power of the dollar amount entered after accounting for inflation from the start year to the end year. If the time period involves years later than 2017, a portion of this result is based on your future inflation rate entry. This result represents the dollar amount difference between the starting buying power and the ending buying power. Note that a negative number indicates deflation, which is usually the result of the starting year being later than the ending year. This is the total percentage the inflation rate increased or decreased from the start year to the end year. This is the average annual rate of inflation from the start year to the end year. If you would like to save the current entries to the secure online database, tap or click on the Data tab, select "New Data Record", give the data record a name, then tap or click the Save button. To save changes to previously saved entries, simply tap the Save button. Please select and "Clear" any data records you no longer need. IMPORTANT: Numeric entry fields must not contain dollar signs, percent signs, commas, spaces, etc. (only digits 0-9 and decimal points are allowed). Click the Terms tab above for a more detailed description of each entry. Enter the dollar amount for the starting year. Enter the 4-digit starting year. Enter the 4-digit ending year. If the time span includes years beyond 2017, enter the expected average annual inflation rate for future years. Click the "Calculate Inflation" button and then scroll down to view the results. Click the ? tab for Help & Tools instructions. What CPI is, why it's important, and what causes it to rise or fall. 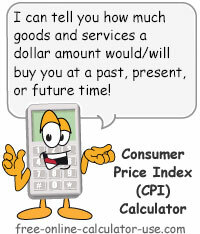 CPI stands for Consumer Price Index, which is an index maintained and reported by the U.S. Bureau of Labor Statistics. Index: The total average cost urban consumers pay for a predefined basket of goods and services. Percent Change: The percentage the index changed from the last reporting period, which is often referred to as the rate of inflation (or deflation if the index shrinks). For more information about the consumer price index, please visit the official CPI website. Retirement Planning: In order to prepare for retirement you need to factor in inflation to predict how much you will need to earn in the future to afford your present lifestyle. Adjusting Money Values: If you borrow or lend a sum of money today, the forecasted rate of inflation will help to determine what that sum will be worth when it is returned to the rightful owner. Cost of Living Adjustments: In order for you to maintain your current standard of living, your annual salary or gross wages will need to keep pace with annual rate of inflation (see the Salary Inflation Calculator to see what your raise needs to be this year). 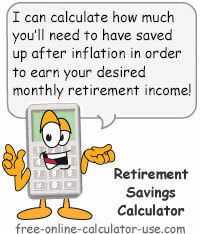 In the case of retirement planning, if you determine you will need $50,000 (in today's dollars) in annual retirement income 20-years from now, and you estimate the average inflation rate will be 2.5%, the effects of inflation will mean you will need to earn $81,930.82 then in order to buy what $50,000 will buy today. As for adjusting money values, if you were to lend me $1,000 today with the promise that I will pay you back in 10-years, and you anticipate a 2.5% inflation rate, when I pay you back your buying power will have been reduced to $781.20. So to avoid losing buying power on the deal, you would need to insist that I pay you $1,280.08 at the end of the 10-year loan. Finally, if you are not receiving annual cost of living raises that are equal to or greater than the rate of inflation, your buying power will be decreasing even if your wages are increasing. While there are many factors that influence the CPI, the predominant factor is the state of the economy. If the economy is shrinking, consumers have less money to spend, and therefore businesses are forced to reduce their prices to get rid of their excess supply of products. Widespread shrinking prices often causes the CPI to shrink (deflation), as was the case in 2009. On the other hand, if the economy is growing, consumers have more money to spend, and therefore businesses tend to increase their prices to compensate for the increased demand (build new factories, hire more workers, etc.). Widespread price increases typically causes the CPI to rise (inflation). Just a quick glance of over the historical Consumer Price Index and you will be able to quickly tell when the economy was shrinking (negative percent change) and when it was growing the fastest (higher positive percent changes).